It’s happened!!! 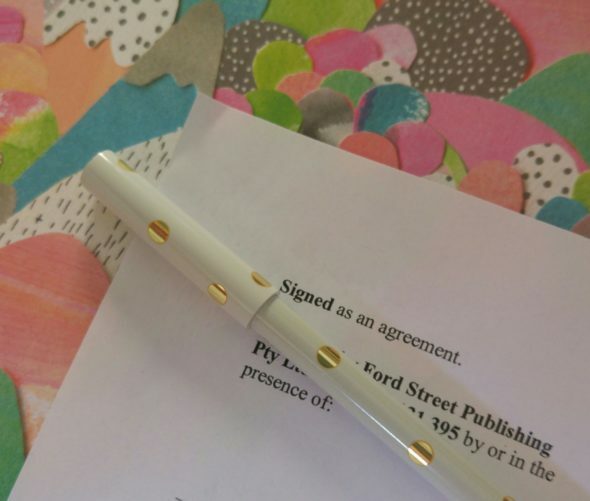 I officially have a picture book on its way! Super excited to share that Melbourne-based publisher Ford Street will be bringing one of my favourite picture book manuscripts to life. I’ll share more about the book closer to time, but basically this came about due to a pitching session at CYA Conference with Meredith Costain (also the writerly brains behind huge kidlit hits like the Ella Diaries series, which I’ve long admired). Looking forward to working with publisher Paul Collins and my future mystery illustrator! The CYA Conference has played a huge role in my writing journey so far – it was one of the very first writing events I ever attended, and has connected me with lots of great writers, illustrators and publishers over the last few years. AND it was even the subject of our podcast One More Page‘s first ever event special (you can listen to it here). I highly recommend it to anyone setting out on their kidlit journey. Speaking of One More Page, we’ve just cracked 12,000 downloads and we’re recording the final couple of episodes of 2018. 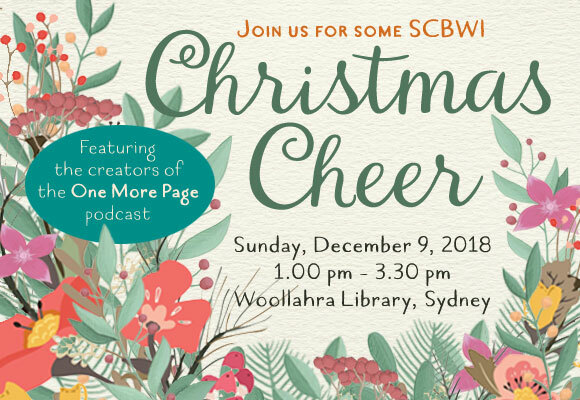 It’s been so much fun, and to top off a great first year of podcasting we’ve been invited to be guest speakers at the SCBWI Sydney Christmas party, woo hoo! If you’re a Sydney SCBWI-ite, hope to see you there! 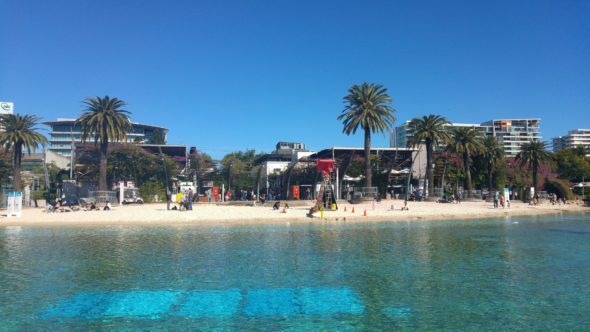 Um, Southbank – are you sure it’s winter? What a weekend … I’m not sure I’ve fully processed the whirlwind that was CYA 2018! The highs, the lows … do we have to talk about the lows?! CYA was a rollercoaster of emotions for me as I had the drama of a cancelled flight to contend with and a bunch of missed editor appointments on the first conference day (not to mention missing the dinner, boo!). But thanks to the generosity and flexibility of Tina Clark, Debbie Kahl and the superstar CYA team, and the wonderfully accommodating Sue Whiting, all was back on track and squeezed into the full conference day. Hooray! All of that aside, the conference was jam-packed. 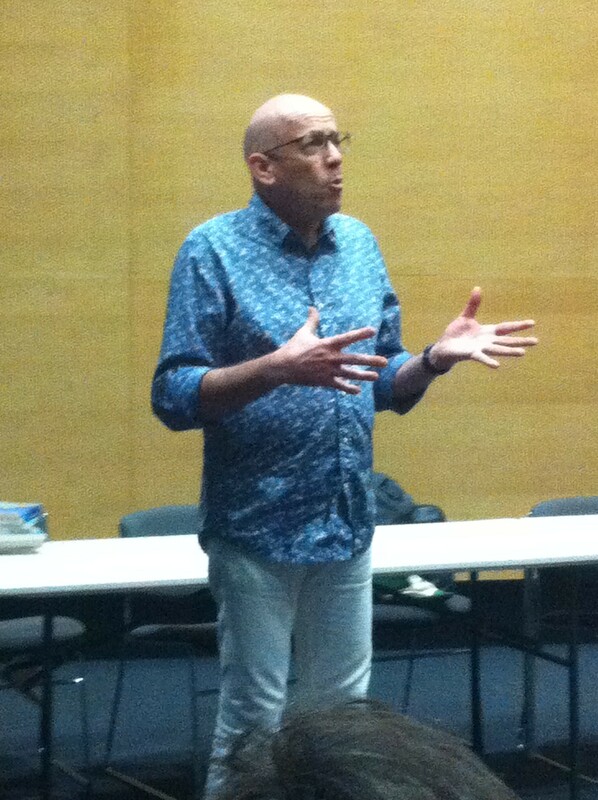 I volunteered for a bit, heard a session for a bit (Claire Saxby’s picture book masterclass – brilliant!) and podcasted for a lot. Nat and I interviewed a bunch of different conference attendees and presenters, and put together a special bonus episode of One More Page revolving around CYA. You can take a listen here. Books for sale at CYA – so many fab friends and creators! Aside from podcasting, another high was receiving two 2nd place awards for the CYA Competition, one for a picture book in the preschool category, the other for a non-fiction picture book. And my One More Page co-host Nat also took home two 2nds and a 1st in the picture books primary category and for a chapter book. Hooray! It was so much fun as always to catch up with friends, interstate writers and illustrators and meet some new people. We met Zanni Louise which was awesome – after interviewing her remotely for the podcast it was so nice to chat in real life! Post-conference, there was the obligatory dinner and wine with some of the writerly gang, and a next day breakfast and stroll around Southbank. So holiday-ish. So SUNNY! So after another mega dose of conference fun and writerly inspiration, it’s time to put the writing advice in action. Thanks to the organisers for a fabulous time! There have been so many fun, inspiring writerly things in the last couple of months, from writers’ festivals and conferences, to competitions, courses and (I think) Australia’s first Twitter pitch-fest! In May, I saw authors Alice Pung and Sofie Laguna in conversation at the Sydney Writers’ Festival. Their discussion spanned writing from different perspectives, whether it be from a child or teen’s point of view, to a character who thinks in a different kind of way – a voice Sofia Laguna nailed with The Eye of the Sheep’s narrator, Jimmy. I loved hearing about Alice Pung’s own background and how it informs her stories (with more than a touch of her life experiences drawn on in her YA novel, Laurinda), and how Sofie came to set The Eye of the Sheep in Melbourne’s industrial outer suburbs. (I highly, highly recommend this book by the way!) Their chat pretty much reinforced my fangirl love for both of these authors, and guaranteed I’ll purchase anything else they write! Then there was the Twitter pitch contest, a mainstay of the US writing scene but pretty much non-existent here – until now. Children’s author and organiser extraordinaire Aleesah Darlison initiated the comp (held by the NSW Writers’ Centre, enhanced by their GIF superpowers), where you basically had to pitch your book in 140 characters or less for an agent to sift through and shortlist. I loved the challenge of distilling a story into such a compact form, and it was just as fun reading all the other pitches. Excitement levels peaked when some of my critique group members (Kate Simpson and Catherine Pelosi) were shortlisted. The eventual winners were Selene G for her YA pitch, and Laura Greaves, who was fast tracked to the live pitching session at the Kids and YA Festival for her picture book. I then attended a pitching seminar with freelance editor Laurel Cohn at the NSW Writers’ Centre. One of the most fascinating aspects of the session was seeing some examples of real-life successful pitches that lead to publishing deals. One of them was for Samantha Turnbull’s junior fiction series, The Anti-Princess Club – she was contacted by Allen & Unwin TWO HOURS after submitting it to their Friday Pitch slushpile(!) Ultimately, Laurel’s advice was to distill your story to an ‘essence sentence’ and build on it from there to develop a blurb, a 1-3 sentence response to ‘what are you writing about?’ and a longer synopsis. While the session was probably more applicable to written pitches, there was advice that could be applied to other pitch types too (verbal, Twitter etc.). The Kids & YA Festival is held every two years at the NSW Writers’ Centre. This was my second time at this day long inspiration-fest. Again, Aleesah Darlison did a great job of curating panel sessions on everything from picture book publishing to overseas rights, to all things YA and what publishers want. The day began with a keynote address by author Tristan Bancks, a hilarious and engaging speaker passionate about inspiring kids to write their own stories, traversing the digital world (exploding chicken-off, anyone?) and spreading the book love to developing countries via his charity work. His anecdotes about tapping into his own childhood stories to use in his My Life books was lots of fun. The picture book panel featured EK Books author Katrina McKelvey, who spoke about her random ideas at the worst possible times (apparently there are waterproof notebooks for shower-thinking, who knew?! ), Andrew Daddo on the often drawn-out path to publication (his first book took five years), to the lovely Meredith Costain and Aleesah Darlison. All of these speakers were down to earth, and I was particularly impressed with how, well, normal Andrew Daddo came across. It’s easy to be dubious about the celebrity-turned-children’s book author, particularly if it’s clearly a one-off, ego/CV boosting project, but Andrew came across as the real deal, committed to writing books and grappling with similar issues to the rest of us. The overseas rights panel demonstrated the importance of backing yourself. Jacqueline Harvey self-funds international trips to promote her Clementine Rose and Alice Miranda books, while Michelle Worthington is very driven when it comes to social media marketing. Susanne Gervay is all about both, and emphasised the importance of having industry contacts. Sophie Masson shared some fascinating insights into different markets, such as Korea being a much more receptive market to overseas kids’ books than Japan, for example. Next was a seminar about industry networking with children’s authors Sandy Fussell and Susan Whelan. They discussed how immersing yourself in the industry in the forms of volunteering, book reviewing, mentoring, critiquing and social media networking can all be beneficial – not only for your own contacts, but for giving back and getting to know fellow writers. They both came across as such warm, genuine people with a passion for kids’ books and the industry in general. The YA panel featured the ridiculously accomplished Steph Bowe and Will Kostakis, who were first published as teens, more from Tristan Bancks and insights from Dave Burton. Chaired by Adele Walsh of the fabulous Twitter handle ‘@snarkywench’ the panel touched on everything from tapping into the turmoil of the teen years to achieving longevity as a writer. The publishing panel was a popular one, featuring Anouska Jones of EK Books, Holly Toohey of Penguin Random House, Rochelle Manners of Wombat Books and Tara Wynne of literary agency Curtis Brown. Topics included how they approach their slushpiles, hot topics in children’s books, what they like to see in submissions, and the upcoming titles they’re looking forward to. All very insightful, and at times, amusing (do not send ‘wombat’ books to Wombat Books!). 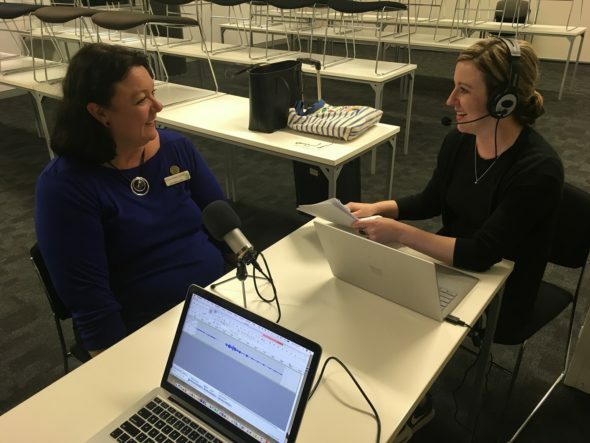 Also – Tara Wynne believes people are born with an X factor, and will blacklist for errors in submissions (no pressure, people!). I just love listening to these types of panels – you gain insights into the personalities and quirks of publishing people. All very insider-y. 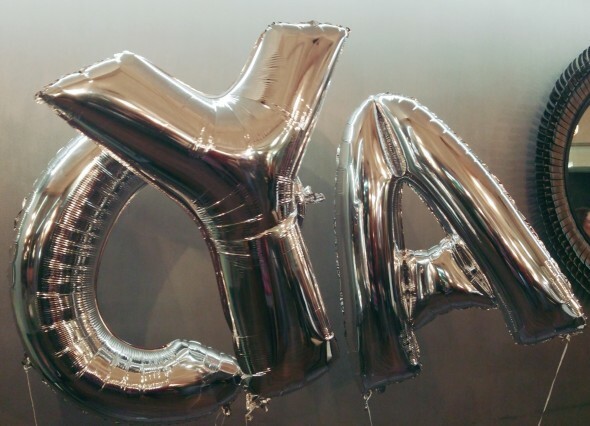 This year’s CYA Conference was bigger, brighter and buzzier than ever, from the record number of attendees to the winning light box and balloon props. Along with the whole learning aspect, CYA is such an amazing event for connecting with other writers and creators. It was so nice to chat with some writers IRL who I knew (or knew of) from orbiting the same patches of kidlit cyberspace, like the lovely Dimity Powell and Kaye Baillie. And I met a fellow student from my MA course at Deakin, Melbourne-dwelling YA writer Alex Fairhill – so fun to connect after critiquing each other’s work and chatting online during our course! We heard hilarious anecdotes from author James Phelan (hipsters, tanks – you had to be there, really, but I was doing that thing where you realise you’re laughing more than anyone around you), an in-depth look at picture books with author Katrina Germein (the key is rule-breaking! ), and a super-intriguing ‘first page’ panel where publishers revealed what would or wouldn’t compel them to read a manuscript further. The CYA Competition results were also announced, for manuscripts and illustrations across categories ranging from pre-schooler picture books to YA novels. It was exciting to see a bunch of people from my writing group represented. Kim Astill and Catherine Pelosi both came 1st (PBs and JF, respectively), and Nat Amoore came third for her MG novel. And I came 3rd for a non-fiction picture book! Also, yay for Rachel Noble and everyone else who placed. Encouraging all-round! Next on the event agenda is the Sydney-based SCBWI Conference in September. Like the Kids & YA Festival, this one’s only held every two years. It’s my first time attending – cannot wait! In the meantime, it’s back to obsessing over all the books and writing a thing or two. This was my second year attending the excellent CYA Conference, organised by a savvy team of wonderful women headed up by Queensland author Tina Marie Clark. 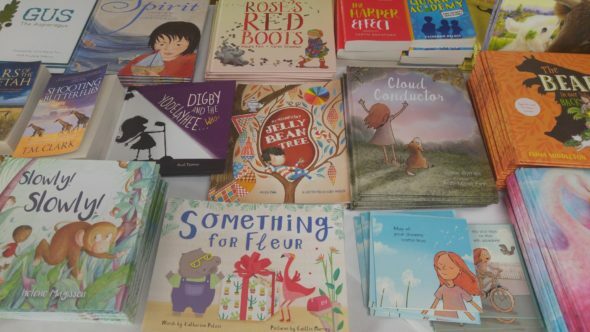 Held in Brisbane, the conference is attended by a cross-section of the Australian children’s book industry, from publishers and literary agents to established authors and illustrators, up-and-comers and fresh arrivals to the world of children’s writing. The conference started with a fun networking night full of inspiring people, drinks, chats, prizes and laughs. The following day was jam-packed with sessions and workshops. First up was a panel talk of success stories stemming from an association with CYA, one of my favourite parts of the conference. This year, we heard from Georgie Donaghey of Creative Kids’ Tales about her path to publication with Lulu (an adorable rhyming picture book about a dancing polar bear), who said ‘rejections fuelled my passion and inspiration’. Illustrator Helene Magisson shared her story and said ‘put all your passion and energy in it and doors will open’. I also really loved first-time author Jennifer Loakes’ story about her writing journey with her picture book Mate and Me, complete with dismay at its’ low competition placing before revising and reworking it – hope for us all! I attended YA author Kaz Delaney’s highly personable session that focused on the oft-neglected ‘saggy middle’ of a narrative that can let down an otherwise amazing beginning and ending. Next, it was the exuberant Meredith Costain’s masterclass on creating hooks or page turners, with some really practical advice and examples. The other major session of the day was a talk by Morris Gleitzman on everything from his writing processes (copious amounts of green tea are a must!) to ideas on characters and the importance of problems in a narrative. ‘We are deeply curious about the problems of our fellow humans,’ he said. As writers, ‘we want to envelop the experience of that problem.’ He explained that characters usually come to him as an embodiment of a problem, and that we ‘sometimes need to let characters fail for their own good’. The day was a whirlwind of ideas, note-taking, coffee-swilling, book-purchasing and connecting with like-minded people. I’m so impressed with the way Tina, Ally, Sam, Debbie, Natalie and the other volunteers pulled together another great conference, providing encouraging words along the way as we attended nerve-wracking pitch sessions and feedback appointments on our work. Post-conference, there was time for dinner with my YA manuscript winning friend and conference roommate Cat Mojseiwicz, then a riverside breakfast and whirl around the art exhibitions at GOMA the next morning before flying back to 10 degrees colder Sydney, armed with inspiration overload.